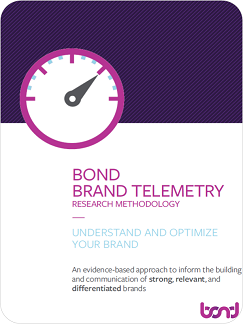 Understand and optimize your brand with Bond Brand Telemetry. Bond Brand Telemetry is an evidence-based approach to inform the building and communication of strong, relevant, and differentiated brands. F1’s telemetry informs the changes needed during the next pit stop; Bond Brand Telemetry helps keep some of Canada’s most successful brands headed in the right direction. Download your free methodology overview and learn more about Bond Brand Telemetry.